A COTTONMOUTH, HURRY KILL IT!!!!….. You may have chosen your home site or your vacation spot around our most precious natural resource, fresh water. You may have bought your ranch or lot all because of that pond that sits at the back. Water is magnetic….we gravitate to it! Water is the most unique substance on Earth and it has many special features and characteristics. The aquatic ecosystem is home to numerous plant and animal species. Among these frogs, fish, turtles, snakes, water fowl, cattails, and water lillies. 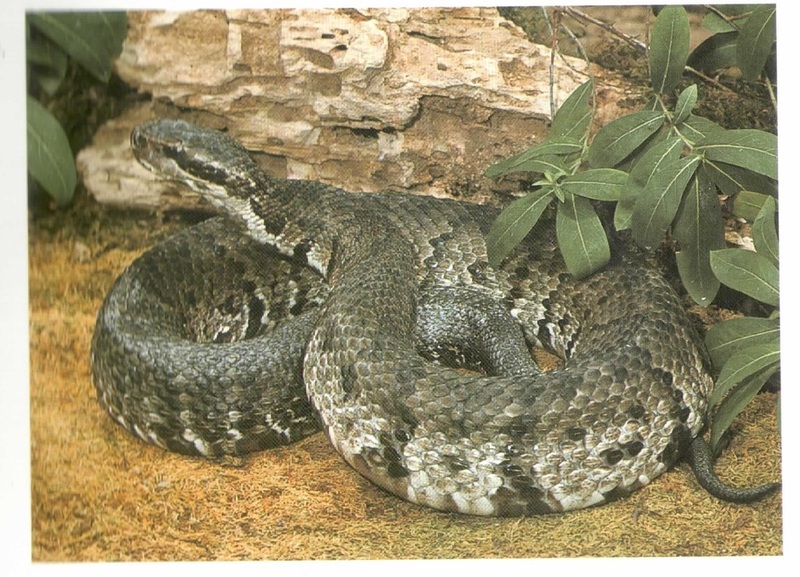 Perhaps the most misunderstood, and loathsome, of these is the snake. 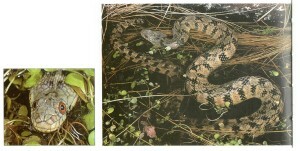 There are many snakes whose preferred habitat description includes water. 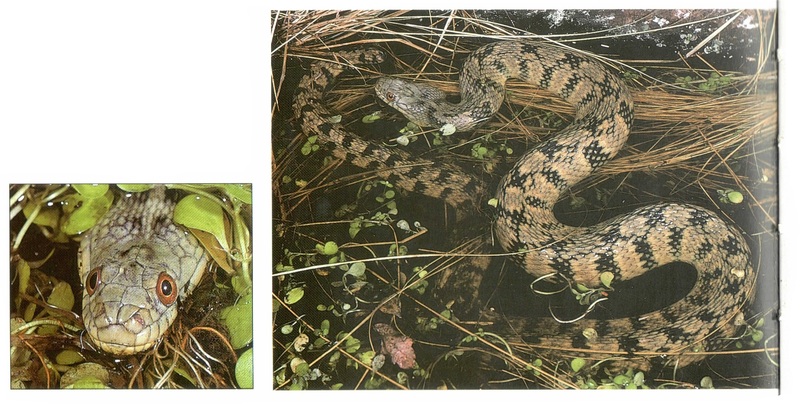 Snakes play a key role in any ecosystem as they are both predator and prey. The most common water snakes in all of Texas and much of the southeast is the non-venomous Diamond Back Water Snake (Nerodia rhombifer rhombifer) and the venomous Western Cottonmouth (Agkistrodon piscivorous leucostoma). 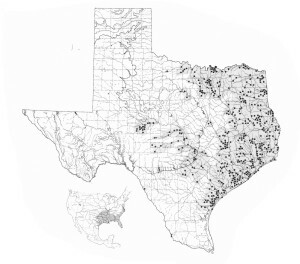 The range of the Western Cottonmouth in Texas is limited to east Texas, areas around Dallas/Fort Worth, southern shorelines, some of the Hill Country, and parts of the Edwards Plateau. Roughly estimating only about 25% of Texas actually has the venomous Western Cottonmouth. 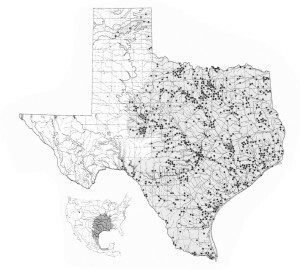 However the Diamond Back Water Snakes range is generally all of Texas, except most of west Texas and the Panhandle (see distribution images below). How can you identify the non venomous Diamond Back Water Snake from the venomous Western Cottonmouth. 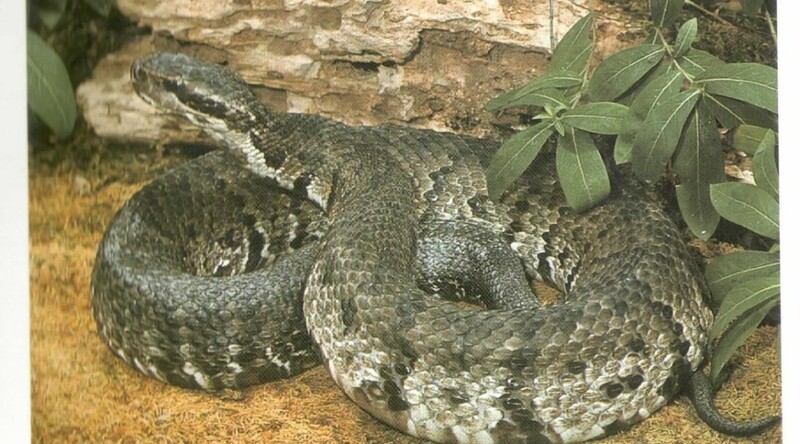 The best way to identify these snakes is up close, but it is not recommended to run up and grab a snake without knowing exactly what kind of snake it is. There are some characteristics that can help identify them without being right next to one (see the table below). 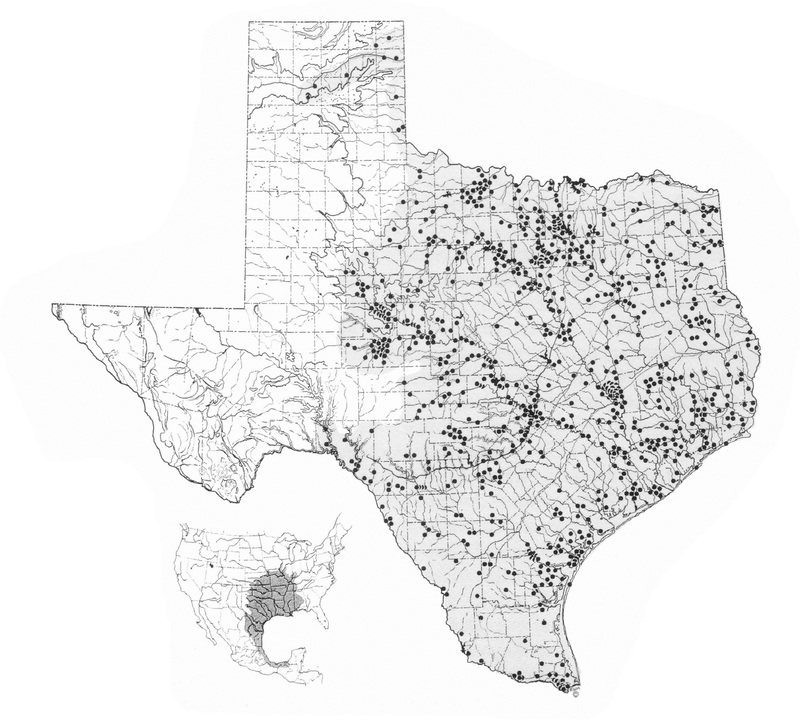 Distribution of Diamond Back Water Snakes (non-venomous) in Texas. Non-venomous Diamond Back Water Snakes. 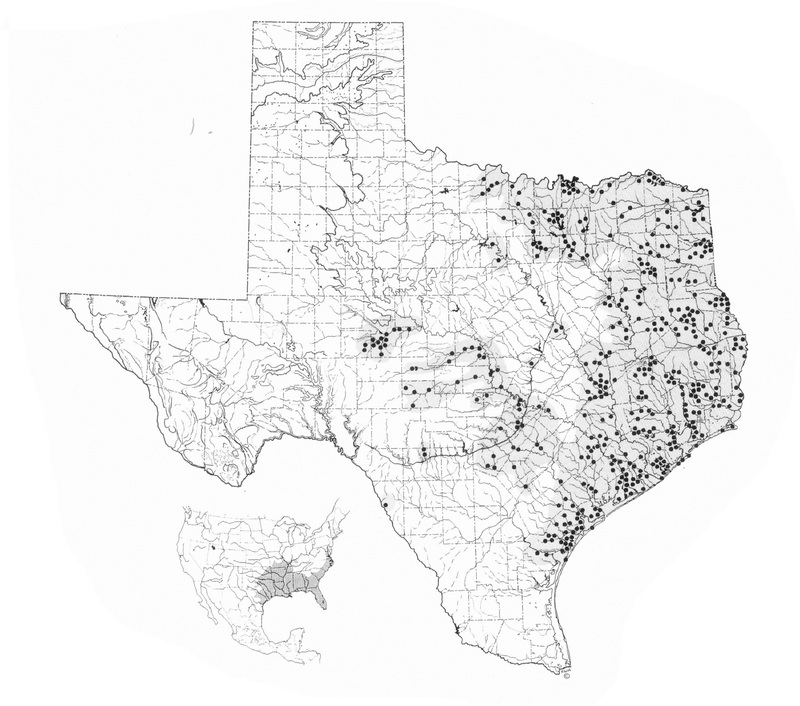 Distribution of Western Cottonmouth water snake in Texas. Typically light brown, yellowish, or olive. “Chain like” markings readily visible unless covered with algae or silt. The markings are similar to chain-link fencing. Very pugnacious, strikes without warning. By knowing the identifying characteristics of the venomous Western Cottonmouth and the non-venomous Diamond Back Water Snake you can feel more at ease at your pond, lake, or river front. Since snakes play a key role in any ecosystem it is advised not to kill these snakes, however exceptions are sometimes made when they are close to your home. 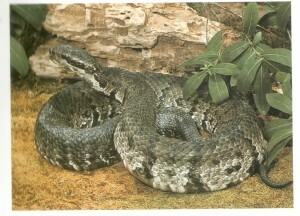 The goal should be to discourage snakes from living in your pond or lake. Keep a 15-20′ wide strip mowed around your pond, lake, or river front. The snakes like the protection of brush and grasses, it makes them feel secure. Make sure when you are mowing this strip that the clippings do not go directly into the pond or lake, this will encourage algae blooms. Limit the amount of debris touching the ground. Keep wood piles, garden hoses, swim toys, etc. off of the ground, these can make an excellent hiding place for snakes.